I had a debate recently with someone who believed that, when working with complicated analytics, it was important to explain the process and statistical methodology to add credibility to the storyteller and the message. His view was that this was important to all audiences, since credibility was the most important facet to portray in storytelling. I disagree. I think justifying and explaining complex ideas simply for the purposes of providing credibility, is one thing you can do to distract people from your message. This technique can be viewed as distracting or even arrogant. It can come across as insensitive too, which happened to me once: “Let me explain the details as I know you don’t understand these statistics.” For me, at that moment, the story was already lost. Ultimately, your audience isn’t concerned about you, your process or your expertise. They are concerned about how the message you are there to deliver is going to impact the business, from whatever perspective they see it. In understanding this, we see the importance of customising your message. Just as a marketing expert will customise their method and approach, based on the target audience, so too must the HR analytics expert customise both their message, and their delivery of the message, in order to be effective. Customisation involves knowing who you are speaking with, what drives them and then determining the best way to connect with that audience. This can also include consideration of how much time you should allocate; who the best candidate to present may be, if there are options; and the method for your presentation. Since data analytics is all about the human element, it is worthwhile trying to ‘humanise’ the executive audience. Let’s take a non-business topic to understand this. Consider a message about responsible driving such as drinking and driving, or the use of mobile phones while driving. The message needs to be delivered differently to teenagers, parents and professional audiences. What are the differences in delivery between a poster or radio advertisement campaign and a heavily detailed statistical report? What about the use of social media and how that will reach your audience and the affect it will have? Now apply these same distinctions to your own topic, story and method of delivery. In The Power of People: Learn How Successful Organisations Use Workforce Analytics to Improve Business Performance, we explore four essential audience categories that might help explain the differences you must consider (see figure below). 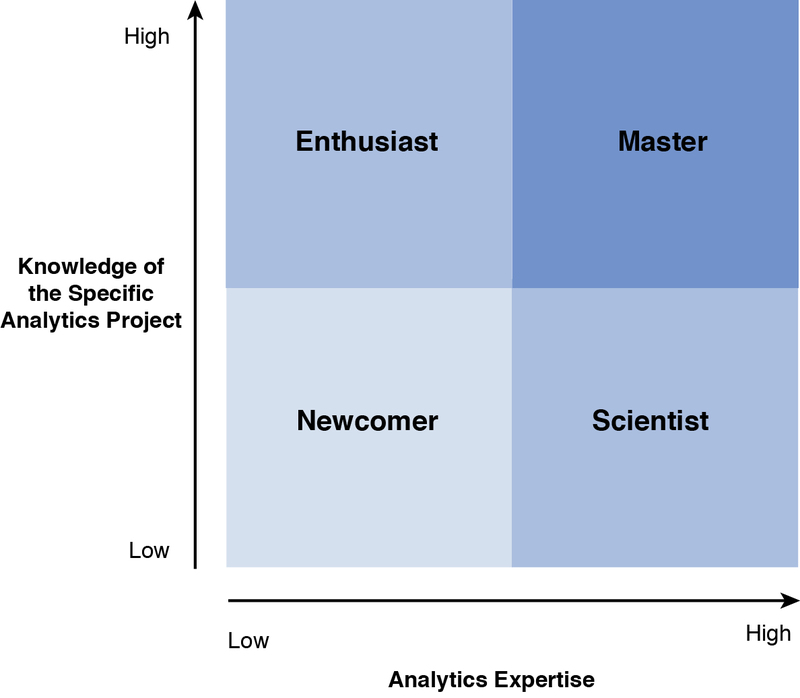 This person has little or no experience with analytics, and perhaps has a goal in mind but no connection to how to attain their goal, or how your expertise may benefit them. In our driving analogy, think of this as the new teenage driver. The message must be high-level, very clear, often visual and outline unambiguously the importance of the issue. This person has the knowledge of the project but lacks the experience with analytics to grasp some of the finer points. This is the person who eagerly seeks guidance, results and reference points from which to understand some of the detail. They will be keen to listen and engage with you, but do not want the topic to be over-complicated. They are already your advocates, so don’t put them off with too much technical jargon. Put into perspective, this may be the parent audience in our analogy. They are passionate about understanding the detail of responsible driving and helping their children but may be lacking in some fundamentals and details to emphasise the points they wish to make to their children. Another potential audience type is the scientist. This is the person who is all about the numbers, the process and the results. This category may care less about the human aspect of the project than about the process itself, what it reveals and the potential it may offer for other projects. In our responsible driving analogy, consider this to be the politician, the lawmaker, the person who needs data to justify and support their decision. Finally, there is the master. In many ways, this is the ideal audience type because this group possesses both interest and technical knowledge to be able to appreciate the more complete picture. They are a supporter of your topic and are a master of the information. However, they may not have the details of the specific project to put their own story into perspective or be able to persuade their own audiences. In our driving analogy, consider these to be the front-line experts: law enforcement officers, professional counsellors or driving instructors. They are trained and experienced to see the complete picture but may lack the latest research and information. Beyond the categories outlined above, which can help you streamline and focus your message based on the target audience, there is an essential understanding of the role of your audience in the greater scheme of a company or organisation that is critical to telling the right story. While there may be some along the hierarchy of a company whose job it is to understand, be able to connect the dots and to consider the interoperability of certain data and information, this is a specific person with a specific role. Often, these people are not the decision makers, but, rather, a stage in the decision process. The executive audience usually are focused on the big picture importance of what you have to share. Your story must focus on answering essential questions, as quickly and efficiently as possible. Presumably you will understand your results well enough to answer questions if they do want details about a specific aspect but it is key to go in with the focus on essentials. Think before you speak. Before you speak, construct your story. And to construct your story, think about your audience and consider the world from their perspective. For this executive audience, understanding them must be part of your overall project. Know them: the issues they face, how much time they have, their view on the business, and what they need from you. Since data analytics is all about the human element, it is also worthwhile trying to ‘humanise’ the executive audience. While you need to deliver the message quickly and concisely, if you can also do it in a way that resonates with them – personally or professionally – through a past experience, interest or real-world problem, you will get their attention in a more meaningful way. To communicate your story effectively, you must be heard. To be heard, you must connect with your audience with a message that is relevant to them, and delivered in a way they can understand. Do not treat everyone the same. Think before you speak. Before you speak, construct your story. And to construct your story, think about your audience and consider the world from their perspective. It’s not about you – it’s about them and the business. Several elements of this article were reproduced from The Power of People: Learn How Successful Organizations Use Workforce Analytics to Improve Performance. Guenole, Nigel; Ferrar, Jonathan and Feinzig, Sheri. Pearson FT Press, May 2017. Jonathan Ferrar is a respected consultant, speaker, author and business advisor in Human Resources, strategy and analytics. He advises clients on how to establish strategies and plans that will improve business performance through the power of people. He has considerable global experience in Human Resources, People Analytics, Strategy & Transformation and Product Management. Jonathan was listed as one of the global Top HR Analytics Influencers on LinkedIn in 2014, one of the People Analytics Experts to Follow in 2016 by Jibe, and one of the Top 20 Experts in People Analytics in 2017 by Sage People. Before he started his own consultancy business (Ochre Rock Limited), Jonathan worked for more than 25 years in corporate business in both the United Kingdom and the United States. He holds degrees from the University of Cambridge and a postgraduate diploma from Kingston Business School. He is a Chartered Fellow of the Chartered Institute of Personnel and Development (Chartered FCIPD).